Hi guys! You might remember this article we wrote in December on the newly named Pantone color of the year, Greenery. As a site that revolves around all things colorful, you can imagine how excited we get whenever Pantone names the next year’s color. And we have to say, we’re really excited about this green hue, especially now that spring has sprung (ha, I had to!). Like we mentioned, it’s nice when a color is more than just a pretty shade, but something symbolic, too. And we love that naming Greenery as the Pantone color of the year was inspired by rejuvenating, revitalizing, and reassurance, as well as a green lifestyle, of course. All in all, it’s a color we can definitely get behind. This certainly isn’t a new color, as we’ve seen this shade of green in years past, especially during the spring season, but we are thrilled it’s showing its face out and about even more so these days. The ladies below sure know how to rock green. Don’t you think? The best part is that there are a bunch of collections out right now doing green so very well, such as Tory Burch, Tory Sport, Draper James, Ann Taylor, Delpozo, Alice + Olivia, and J.Crew, to name a few. We can’t get enough! And just last week, Carrie styled a beautiful green floral print two different ways. Now, the big question : how does one wear green? 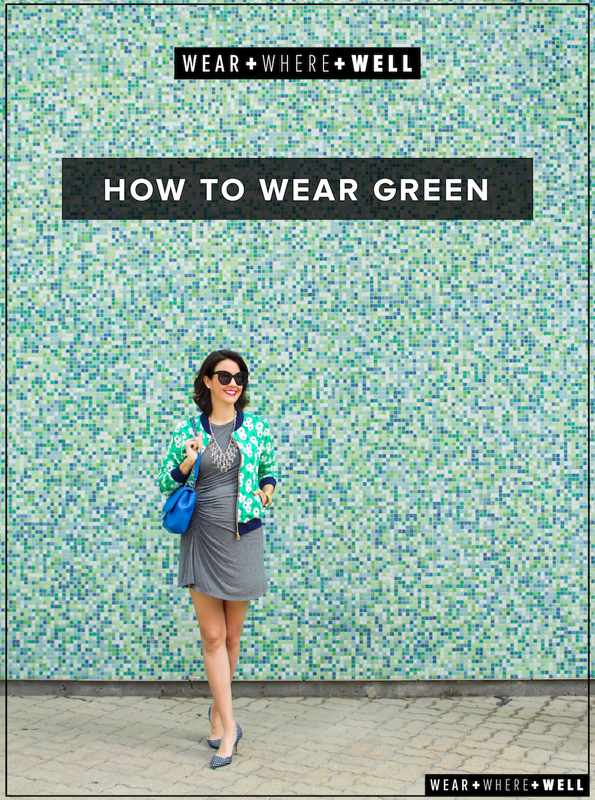 Well, we’re here to give you some tips and pointers that will ensure your green look is flawless! We mentioned some briefly in December’s article, but as promised, we’re expanding upon our list, so keep on reading. Now, when it comes to pairing green with other colors, the two that immediately come to mind are navy and pink. There’s something so classic and sophisticated, yet totally stylish, about navy. And pink and green are what springtime is made of; it’s equal parts preppy, modern, chic, and timeless. Don’t be afraid to add even more colors to the mix. Try green with deep purple, yellow, and gold details. One color we do urge you to shy away from when wearing green would be red (unless it’s around Christmas time and you’re dressing for the occasion, in which case, go for it). As we’ve mentioned before, we’re all about a monochromatic look. There’s nothing wrong with that at all. In fact, we kind of adore it. However, when going head to toe green, it is great to break up the color, whether by way of accessories, jewelry, or shoes. For example, if wearing a pair of green trousers with a green blouse, opt for a skinny pink or metallic gold belt. As well, pick just a couple shades of green that complement each other, so the outfit flows nicely from head to toe. 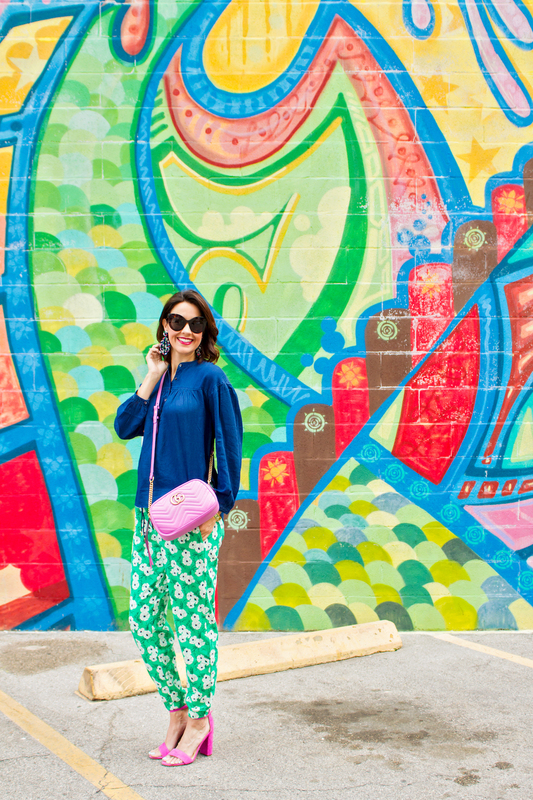 Prints in green are beautiful (case in point : Carrie’s looks above). Truly, there’s no print we would tell you to steer clear of. Stripes, polka dots, gingham; the options are endless. And prints always add a bit of a fun element to a look. Don’t save green just for jeans and more casual looks. Green looks great in the form of dresses and gowns. In fact, it’s a very rich color that pairs so nicely with gold jewelry. Maybe next dressy event you have, put aside that LBD and go for the green. And, as always, don’t forget about the accessories. This is especially true for those who might not be such a fan of wearing color; you can simply add some green accessories to the mix. Whether a necklace, earrings, a bag, shoes, or sunglasses, there are plenty of green accessories out there catching our eye. And now it’s time to shop! I’ve got my eye on quite a few of the pieces below, such as this dress, this bag, and these sandals. Along with the beautiful items we mentioned above, here are 35 more that we think you’ll love. So, what do you think? Are you feeling this green hue as much as we are? What’s your favorite pick from above? We always love hearing from you, so be sure to share your comments below. Have a great rest of your day! Great post! This green is such a pretty colour, but I’ve yet to really embrace it. I like how it pairs with pink, which I have plenty of in my closet! Yes, pairing with pink is one of my favorite looks. It gives it such a fresh look for spring. That maxi skirt in the second photo is gorgeous!